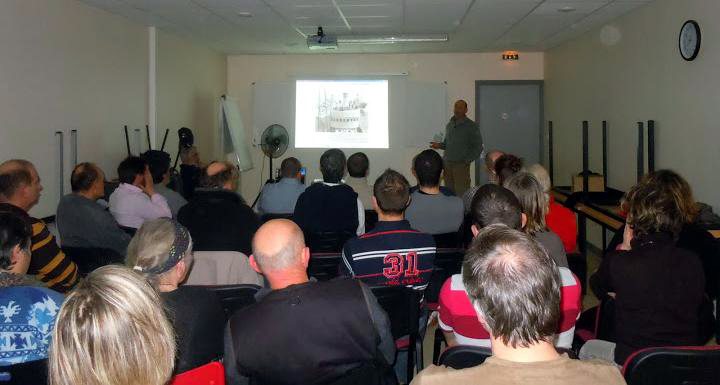 On Saturday January, 19th, l'Expédition Scyllias was invited by the Centre Subaquatique Lorientais (Lorient Dive Centre, www.csl56.com) to present the result of its activity in the Morbihan area and especially to discuss the action on the deep wrecks regarding the naval battle of 15 July 1944. These perils of the sea are the result of the opposition of a German cargo-ship escorted by three armed trawlers of the 14th submarine chaser flotilla based in Lorient to an Allied squadron composed of HMCS Haida (Canadian), HMS Tartar (British) and ORP Blyskawica (Polish). On this occasion was projected a series of historical and underwater photographs allowing to the enthusiast people who were present to discover another facet of diving where the historical aspect meets the technical one to highlight from oblivion an ignored page of maritime history. On the left : a specialist audience quickly conquered. 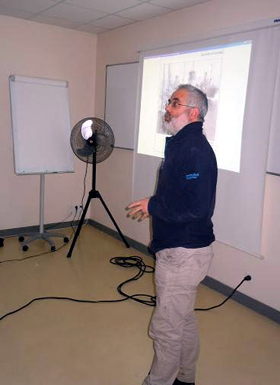 On the right : Vincent Gautron evoking L'Expédition Scyllias' activity in Morbihan.